We haven’t been all summer yet and my mom is coming up before school starts. This would be awesome to win and go w her and my son. Our favorite is actually the lazy river. He hasn’t been able to ride a ride yet (and I was pregnant last year so I couldn’t go w him!). My girls would love to go to Hawaiaan falls. We have not been able to go all summer. This would put the final fun thing to do before school starts. My girls are finally tall enough to ride all the rides. We would love to win these tickets, we haven’t been able to go all summer but really love water parks. I think it would be so nice to take my son and a few of his friends before school starts. We have yet to go to Hawaiian Falls – how fun it we won! And we could bring friends too! I would love to be able to take my kids to Hawaiian Falls this summer. They have gone threw some hard times this summer since the separation. I am a single mom of 4 kids and just lost my job a month ago. It would be nice for them to do one fun thing this summer. My kids have always wanted to go to Hawaiian Falls we never had a chance to go. But heard wonderful things about the place. I could go with the sad story route but I don’t think that would win you guys over. I just know that it would be a blessing if my family had a chance to win the tickets. Good luck to all that have entered. This would great end of summer staycation trip for the family, we ahve never been so this would be a treat. What a way to end Summer 2013 at Hawaiian Falls! My three children would so enjoy this! Their favorite ride(s) are the Wave Pool and the Lazy River. I would love to take my 6 children to Hawaiian Falls for a final treat for the summer. We have spent too much time in the house together this summer. We need a break. My husband and childen love the waikiki wipeout. I am a newly single mom with 4 kids at home. They haven’t been able to do anything this summer. They would love to take the plunge on the high slide and i woukd love to ride the lazy ride. My 5 year old learned to swim this summer and now loves the water. We have never been to Hawaiian Falls, so I’d love to take him so he can find his favorite ride! 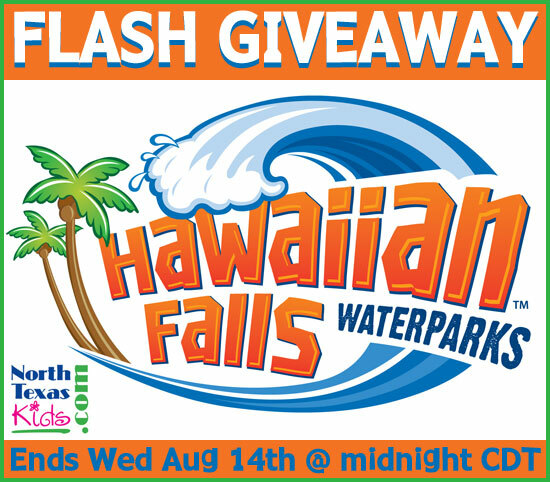 My daughters (3-1/2 and 6-1/2) would be so excited to win tickets to Hawaiian Falls! They are *obsessed* with the lazy river. It would be a special “end of summer” treat before school starts to be able to take them to Hawaiian Falls! Thank you for the opportunity to win! North Texas Kids is awesome! We looove Hawaiin Falls but have not been this summer. BooHoo! ;( Our two young boys would just be heaven if we were able to go before heading back to school. Our favorite ride is Pineapple Express …. Because we like to imagine Spongebob (we assume it is his fav too!) going down with us …. Ha! This would be to perfect way to beat the summer heat with a family picnic and bond time. What a fun way to end the summer! Kids would love the watersides! Wow!!! I would love to take my daughter to Hawaiian Falls…Simply because we have not been to any water parks and with this weather it would be wonderful to go before school starts. My family has never been to Hawaiian Falls so, we can’t say we have a favorite ride. My daughter would love it and it would be a great experience for her. Thanks! I hope I can be lucky enough to get those tickets for my family. I’d like the tickets to use as a fun way to wind up the summer. My family has never been so I don’t have a favorite ride. I would love to take my college student, 1st Grader and their friends to Breaker Bay for our last get together before the academic year starts. I’d love to take the kids before school starts! Even though we drive by it daily (Mansfield), we have never been because it can get pretty pricey for a big family! But, I know our fave ride will be the lazy river, we love goofing off together and just relaxing. We would love to do something fun this summer and show the BRIT a good time! We recently took our kids to Hawaiian Falls and would love to be able to take them back! My older kids are 7 and 8 and had a blast on the lazy river and the slide with the music! My little one is 9 months old and to be able to see the pure joy and giggles again when she was in the spray park area of the park would be priceless and an amazing way to end our summer vacation! Thanks! I would love to take my kids for one last “hurrah” before school starts. I love relaxing on the “lazy river”. It’s just my two boys and I and this is the first summer that I didn’t get to take vacation time… but we have had a great summer non-the-less! I know being able to grab a couple of friends and head out to Hawaiian Falls would be the bomb! Especially if the boys know they won them! Go North Texas Kids! Keep up the good work! I’d like to win because I’ve never been there! Since I’ve never been, I don’t have a favorite ride. The Kona Kooler looks nice, though! My family would love to go to Hawaiian Falls!! We have never been before but always wanted to go. My hubby works in the oil field and has been out of town here lately but if coming back today!!! Super excited!!! So it would be a good family outing for us to have before he leaves out again and our boys start school 🙂 We don’t have a favorite ride yet but hope to once we go!! My boys love anything with tubes. My daughter loves the lazy river.Back to school shopping has put a dent in my wallet. This would a awesome end of summer trip. We haven’t been able to take a vacation this summer. I would love to be able to take my kids, ages 11 and 9, to their favorite water park before school starts. My daughter’s favorite ride is the yellow slide and my son’s is the wave pool. They look forward to going here every year. I would love these tickets for my kids. They have been wanting to go, but I have been working a lot and they really didn’t have a summer vacation. It would mean the world to them if they finally got to on and experience it for themselves, instead of someone telling them about it. we have never been to Hawaiian falls but have heard great things. therefore, we don’t have a favorite ride, but a great reason to win the tickets! We have never been so we would love to win! My son an 2 step kids would be so excited! We have never been to Hawaiian Falls, but would love to take my girls as a last ‘hurrah’ before they go back to school. My husband works a lot and we haven’t done anything exciting this summer. This would make for a perfect family day! I have two kids 4 and 8. They love water parks. It would be great to end the summer with a fun family activity since we all go back next week. My family loves the lazy river. Thanks for the chance! My family would love to win the tickets. We’ve never been to HF, but love water parks! What a great way to end the summer! We would love to be able to win these tickets! We’ve never been to Hawaiian Falls so we don’t have a favorite ride. It would be a great end of summer surprise for my 2 daughters! We haven’t been all summer, oops where did the time go?! We love the tidal pool! We have never been to Hawaiian Falls. I would love to take my girls as a last ‘hurrah’ before school starts. My husband works a lot and we haven’t done much of anything exciting this summer. This would make for a great family day!